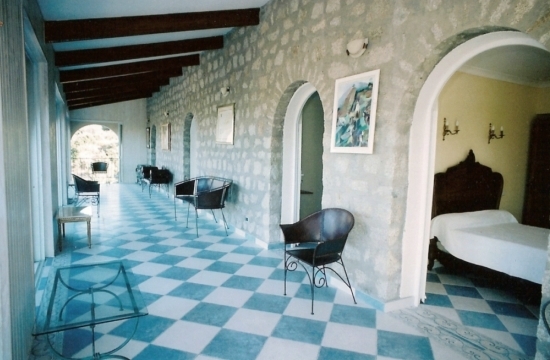 A hop and skip away (1km) from the Calvi harbour and the magnificent white sand beach, our restored stone B & B, located in a landscaped private enclosed park of 3 acres, welcomes you in a peaceful and luxurious setting where the mineral and plant kingdoms intermingle harmoniously, set against 10 acres of controlled “maquis” and magestic rocks extending up behind the house. Our guests (maxi 11) can rest and relax in the hydro-balneo space under the palm trees or stroll through the sculpture garden and citrus fruit orchard and admire the bio vegetable garden. Languages : Français, English, Deutsch, Italiano, Espagnol. On the first floor with private entrance ; 4 rooms for 2 to 3 persons including 2 rooms which can be rented together as a Suite for 4/5 persons, all air conditioned, HD SAT TV/DVD, free Wifi which covers rooms and whole property including hydro-balneo space, safe, patio/salon with leather and wrought iron or cane furniture, offering a panoramic view of the sea, mountains and Citadelle. Fully equipped bathrooms including toilet, towel dryer/heater and hair dryer. On the first floor with private entrance ; 4 rooms for 2 to 3 persons including 2 rooms which can be rented together as a Suite for 4/5 persons, all air conditioned, Digital TV/DVD, free Wifi which covers rooms and whole property including hydro-balneo space, safe, patio/salon with leather and wrought iron or cane furniture, offering a panoramic view of the sea, mountains and Citadelle. Fully equipped bathrooms including toilet, towel dryer/heater and hair dryer. 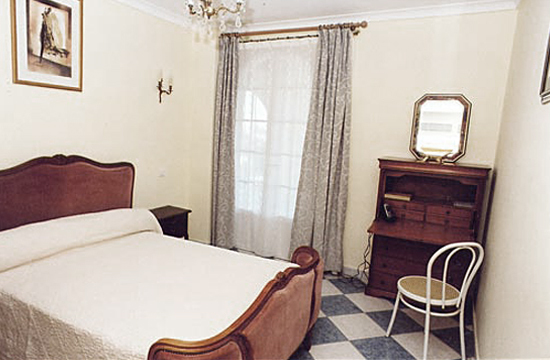 Room N° 2 “Charme” for 2 pers. Furniture ensemble:closet/double bed of walnut and padded, embossed leather, sitting area with sofa (can be used as single bed for 3rd person) and cherry veneer coffee table, oak dressing table, patio space (14sq m). 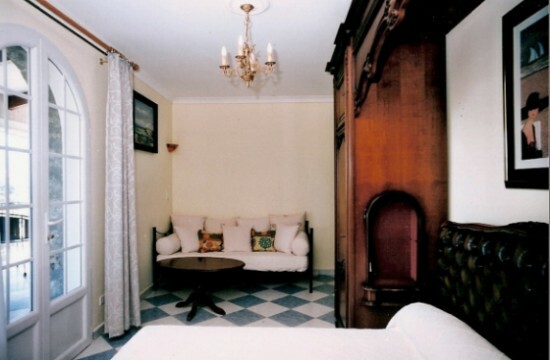 Opposite the room, a private bathroom (7 sq m) with large tiled shower stall, double wash basin with marble counter Grand Total 38 sq m.
Room N° 3 “Standard” (12m²): for 2 pers (12 sq m) cherry wood double bed/velvet plush trim, matching writing desk and chair, patio space (14 sqm.) Opposite – private bathroom (6 sqm) with large tiled shower stall, wash stand with marble counter + an independent toilet with a hand lavabo (4 sqm) Grand Total 36 sq m.
Suite: Rooms N° 3 & N° 4 with their respective bathrooms Grand Total of 76,5 sq m: including private access/hallway (3 sq m) with sliding door. Discounts : 4 to 6 n: – 5% ; 7 n.+ : -10% : Very Early Bird (+6mos before) – 10% ; Early Bird:90 days before except July/Aug. -5% ; July/Aug : 120 days before – 5%. Rentals: helicopter, motorcycle, scooter, bicycle – Activities: small plane outings for Calvi and region by air, beach, diving school, water sports, horseback riding, golf, tennis, mountain trekking, visit of traditional villages and their craft workshops. Bonifato Forest (at the end of the road that goes past the airport):for good walkers. Paying parking lot with billboard showing different trails. 2 to 6 hours depending on which trail chosen. Corsican Cape Circuit & landscapes and Genoese towers: Leave around 7 AM from Calvi towards Ile Rousse. Around 10 kms after Ile Rousse follow signs towards Saint Florent (and not Bastia). Cross through the Agriates Desert -Saint Florent – Nonza – Pino – Centuri – Macinaggio – Santa Severa – Porticiollo Suggestions : lunch at Centuri (grilled langouste)on the harbor, or at the Caribou *** situated between Santa Severa et Porticiollo, or below the road at Porticiollo on the harbor remiscent of the 50’s at the Auberge Torra Marina. (grilled ‘rougets’ fish with a bottle of Nicrosi white wine). Visit of Corte – Vizzavona pass – Ajaccio and return: Leave at sunrise and follow directions given above. At Corte, continue on the main road towards Vizzavona and Ajaaccio. Return trip by same road. Not to miss: The Corte Museum and the Faesch Museum at Ajaccio (show on Napoléon and major works of the Italien masters.) Suggestions: take a meal in the coolness of mountain pass of Vizzavona at the Hotel/Restaurant Monte D’Oro or at Ajaccio. 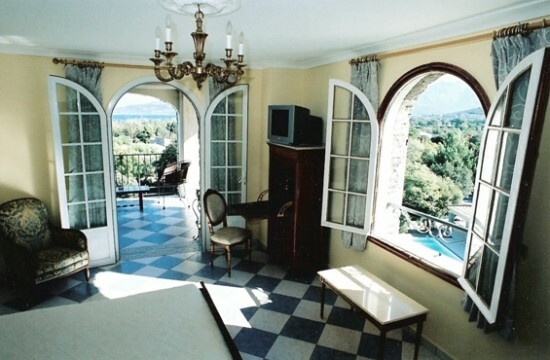 10 to 12 hours day round trip or stay overnight in Ajaccio. In the framework of the GDPR, the information collected on this form is saved in a file computerized by THE MANOR. They are kept for 3 years and are intended for the Recruitment Service and the Sales Department of THE MANOR. In accordance with the law "IT and freedoms", you can exercise your right of access to data about you by mail manor-russum@orange.fr.